VertaseFLI was employed by Entec to carry out radiological remediation works at the former RAF Quedgely site in Gloucester to allow residential redevelopment. 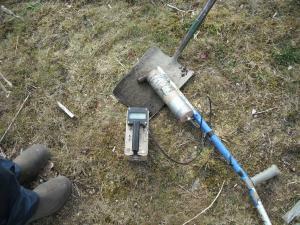 The radioactive materials identified on site were a mixture of point and diffuse sources located in made ground which had an approximate thickness over the site of 0.6m. The radioactivity within this made ground arose from the radioactive element radium-226 which was a constituent in luminous paint which was used on various military equipment, dials, gauges, etc. These artifacts had been deposited as a waste material upon the site during its former use as a RAF base, signs of burnt materials and other landfilled materials were also present within the made ground. The physical artifacts such as dials and compass needles are classed as point sources of radium-266. The diffuse sources have arisen due to weathering and breakdown of such artifacts. The disassociated particles are insoluble and therefore migration is limited within the made ground. The levels of radioactivity concentrations experienced during the remediation were sentenced as one of three categories: free release materials reused on site; exempt waste, disposed of to landfill and; low level waste, disposed of at LLWR at Drigg in Cumbria. 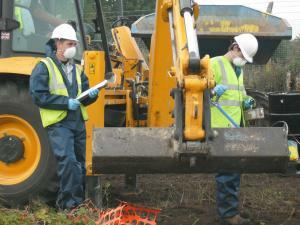 The operational work was undertaken on the basis of pre-identified radiological anomalies being carefully excavated in 200 mm ‘scrapes’ with each partial bucketful being scanned with gamma particle detection equipment and the soils sentenced. Free release waste was set aside for reuse, exempt waste was stockpiled in a lined, bunded area for disposal to landfill and free release waste was collected in P2 205lt drums with sealed lids. Far more waste was discovered than originally envisaged and the decision was taken to transfer the waste from drums into a half height ISO container (HHISO). On completion of transfer from the 72 drums the HHISO was sealed and shipped by suitably qualified VertaseFLI drivers to the low level waste repository at Drigg to be grouted and buried. All personnel in the operational area were required to wear a personal dosimeter badge which on completion of works were analysed by HPA at Porton Down for exposure values. All badges were returned with nil dose recorded.